Working hard never guarantees success, but it certainly puts one in a better position to achieve it. Veteran stand-up comic Erikka Innes has a work ethic that makes her success as a comedian almost a foregone conclusion. She forces herself to write every day, and usually not on topics that are comfortable for her. Granted, this material typically doesn’t make it into her act, but it’s evidence of her rigid determination to keep honing her craft, and it automatically puts her a cut above most stand-up comics. Innes also tries to put out a new comedy album every year, emulating the practice of successful comics. Her latest is Smells Like Nerd Spirit , but she confessed to Working Author that she’s already hatching plans for a third. For the uninitiated, Innes describes her comedy as “nerdy, quirky, smart, and a little bit dark, a lot of biting, dark undertones.” So while she’s happy to work in a bit about the early video game Pong and her childhood pet rock, she’ll just as easily make observations about how similar therapists are to prostitutes, or how pirates would make for poor rapists. “I’ve always been pretty nerdy,” she says, and she works her life into her act, always striving to just be herself on stage. She’s even gone so far as to take out funny bits from her sets because they didn’t reflect her as a person. 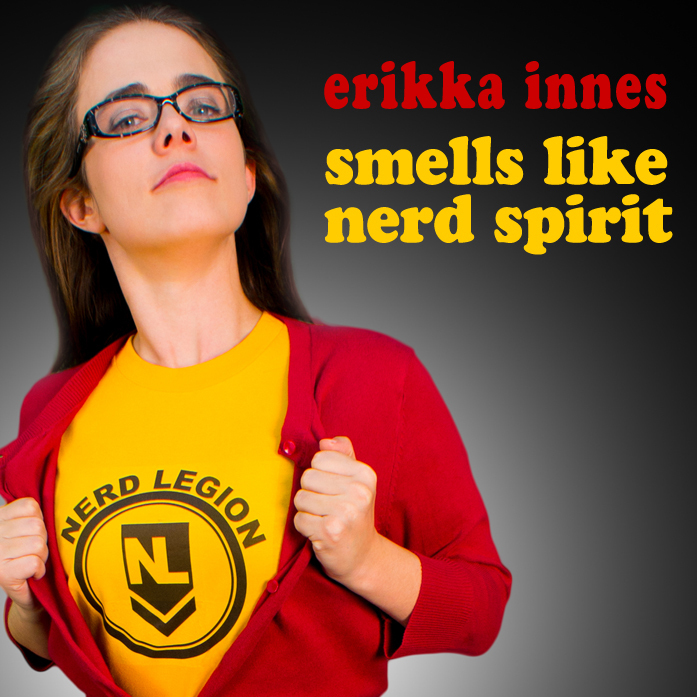 Smells Like Nerd Spirit is available on iTunes and Amazon . See Erikka Innes live at Flappers in Burbank on Thursdays and Saturdays. Follow Erikka on her site www.erikkainnes.com.